Do you get to the end of the day and feel like you have nothing to show for it? If the answer is more than three hours, you could be suffering from meetingitis. Meetings are the opposite of work and they make you grumpy. Are the meetings life-enhancing experiences? 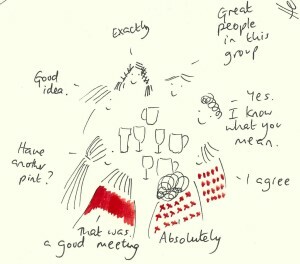 Does your job description include ‘wasting time in pointless meetings’? Do you tell your friends and family, with pride, about all the wonderful meetings you were in? When you sit down with your boss for your pay review, do you tell her about your amazing doodling skills? If you had fewer, shorter meetings, would you spend the time saved on less exciting, innovative and productive work? On your death bed, will you wish that you had spent more time in meetings? Traditional meeting advice about setting an agenda and recording decisions etc is good, as far as it goes but it doesn’t get to the heart of the matter: too many meetings. At Articulate, we have one stand-up meeting at the beginning of the week to plan our work and monthly one-to-ones for mentoring and development plus regular in-person get-togethers. That’s it. All our other meetings come from our clients and we don’t like to say no to them. Do a time and motion study to see where your time is going. We like Toggl as a tool for doing this. Replace status meetings with a weekly email status report. Replace random phone calls with an IM tool like Lync or Skype. Use iDoneThis or just regular emails to keep track of your own productive work and your team’s. Encourage suppliers and clients to use a project management tool like Basecamp. This is what we use at Articulate and we love it when clients embrace it too. Invest time in meetings that matter: one-to-one mentoring for your team, getting to know new customers, brainstorming strategy. Try sending your ‘apologies’ for one meeting a week and using the time saved to focus on making real progress on a critical project. If you call a lot of meetings, try trusting that your colleagues and suppliers can do their job without micromanagement. Stop using dial-in conference calls, which are an evil waste of time. Use Skype video calls, Google Hangouts or UberConference instead. Anything that is not a dial-in conference call is a better meeting. You could also try to agree a meetings charter for your organisation so that everyone knows the rules of the game. Meetings should never last more than 45 minutes. We agree to stay on point and keep the side chat for later. In order of preference, and depending on the context, we use Basecamp, email, Yammer, IM, Skype and then phone calls for communications. However, mentoring, money and important personnel meetings (eg disciplinary meetings) are best done face to face. We prepare an agenda in advance of the meeting. There is always a chair who is responsible for sticking to the agenda and the timetable. The best meetings end early, with clear decisions. For internal meetings, rather than writing minutes, we assign Basecamp tasks to people as we go. For interviews or client meetings, we take notes directly in Salesforce or Basecamp during or immediately after the meeting. And if all else fails, go straight to the pub and buy everyone a drink.